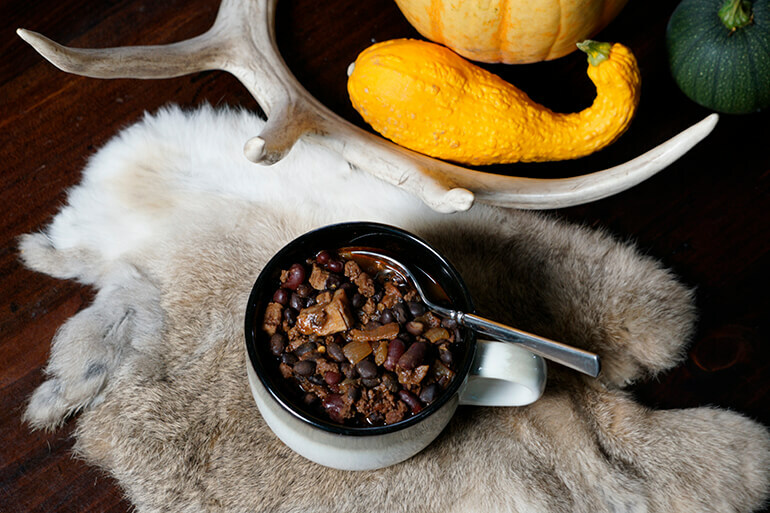 Few foods mark the beginning of fall hunting season as does a big pot of chili simmering away on the stove, or better yet, over the hot coals of a campfire. Something about the thick chunks of meat bubbling in a stew tinged with warm spices just sets the mood for the rest of autumn. A valid argument can be made that chili has its origins in Mexico (although more likely it started among the cliff-dwelling tribes of the Southwest), I posit that chili con carne, however it is made, is among the most American of dishes – a true melting pot of cultures and flavors. My evidence for this is the diversity that ends up the bowl. Wherever you go in the U.S., there's a regional take on chili with the common thread of cheaper cuts of meat – whether ground or in fork-worthy chunks – cooked until tender with some sort of peppers. Although the cooking method is closely related to that of the stew, the absence of root vegetables makes chili its own unique dish. Those cultural difference as to what constitutes a chili is also what it makes it the most contentious of concoctions. Everyone has an opinion of what chili is or isn't, and the party lines are as distinct as one's politics. The most vocal opinion covers the inclusion of beans, although tomatoes are also liable to start an argument in mixed company. Purists look down their noses at the inclusion of chili powder, although the ease offered by those ground, bottled spices are what has carried chili con carne to the masses. It's this pepper-fired populism that gets lost in all the arguments of what chili should or should not be. Instead, I say embrace the diversity and let each chili stand on its own merits. Sometimes you may want a bowl of fiery meat and chiles known as Texas Red, other occasions call for the comfort of mom's family-filling ground meat and bean mixture. Refer to the words of Carroll Shelby, co-founder of the International Chili Society and instigator of the very first and now famous World Championship Chili Cookoff in Terlingua, Texas. "The beauty of chili to me is that it's really a state of mind," said Shelby. "It's what you want when you make it. You can put anything in there you want, make it hot or mild, any blend of spices you feel like at the time. You make it up to suit your mood." 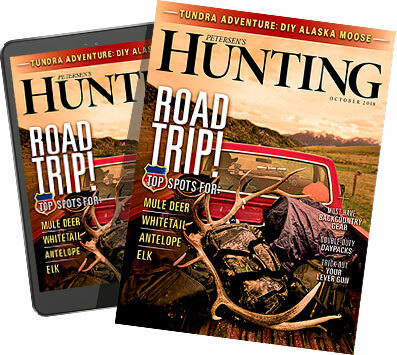 One mood that hunters are always in is the taste for venison, whether it be deer, elk, moose or other game meat. Chili con carne is one of the best ways to satisfy that craving while also taking care of those tougher cuts of meat. The longer cook times combined with the moist environment of a Camp Chef Dutch oven turn cuts from the roast, shoulders or even shanks in to meltingly soft bites of hearty meat. Chili is also a natural vehicle for burger, and the best recipes combine the two for twice the hit of meaty goodness. 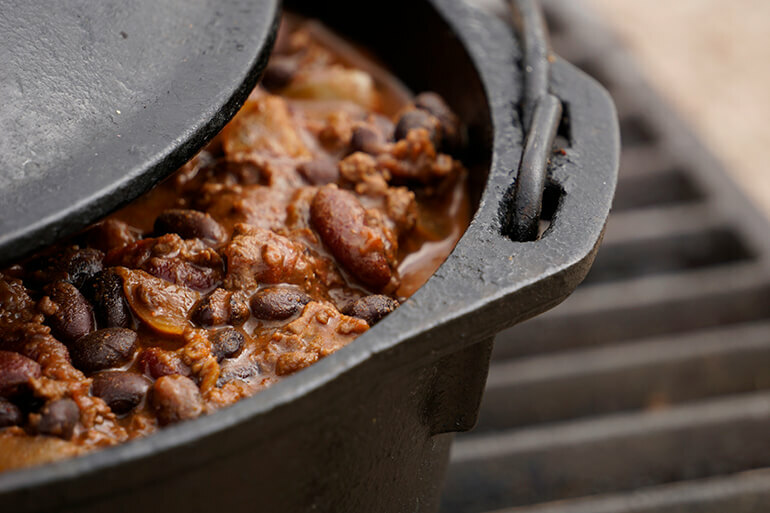 When it comes to a camp-friendly version of chili, easy should be the name of the game. 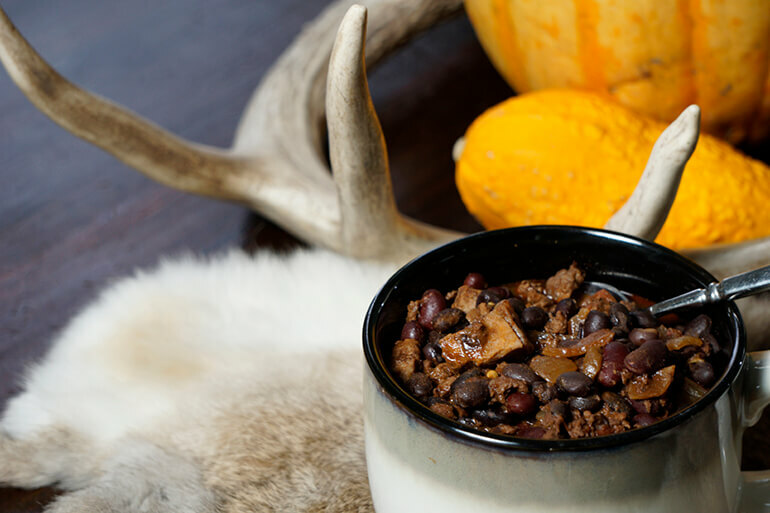 There are more complex recipes out there that require overnight bean soaks, pureed chile peppers and multiple steps that add difficulty to the process of cooking for a crowd of hungry hunters. This is not that recipe. 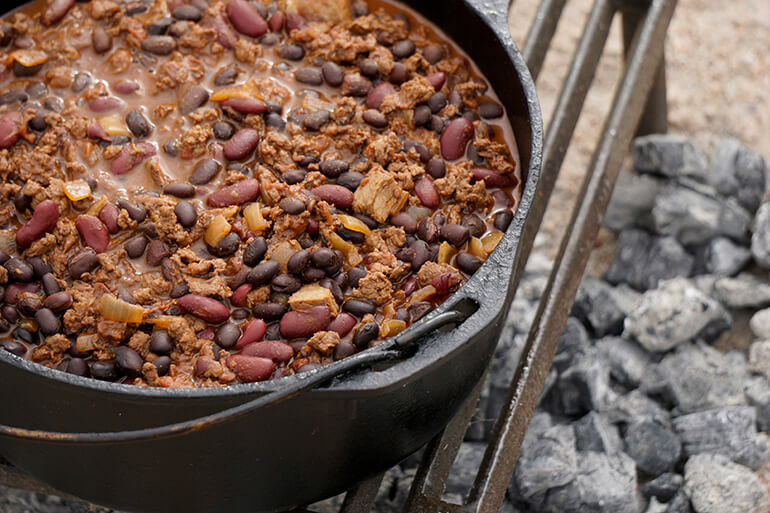 All that is needed for this quick, and delicious camp favorite is a few types of venison – ground and chunked – and a half-dozen or so cans of, yes, beans and tomatoes. Add to that some spices and a surprisingly secret ingredient or two and the result is one that's evolved into what I consider the most classic take on chili. Heat 2-3 tablespoons of bacon fat in a large Dutch set over a hot campfire or medium-high stovetop. Brown the ground elk in the fat, using a fork to break up into pea-sized pieces. Once browned, remove the ground meat from the Dutch oven and heat another 2-3 tablespoons of bacon fat. Toss the stew meat with the seasoned flour and brown in batches in the Dutch oven. Return the ground meat to the Dutch oven and add the grated onion. Sprinkle in the chili seasoning and stir to cover meat in spices. Cook a few minutes to let the spices bloom, then pour in the bottle of dark beer and soy sauce. Let come to simmer, scraping the bottom of the Dutch oven to loosen any fond, or browned bits. Stir in the baker's chocolate and let melt before adding the beans. Stir to combine everything well, adding more beer if there is not enough liquid in the Dutch oven to reach near the level of meat and beans. Cover and move to lower heat to simmer 30 minutes or more. Serve with diced onions, jalapeño rings and grated cheddar.